Steve Bantu Biko (December 18, 1946 – September 12, 1977) was a noted anti-apartheid activist in South Africa in the 1960s and early 1970s. A student leader, he later founded the Black Consciousness Movement which would empower and mobilize much of the urban black population. Since his death in police custody, he has been called a martyr of the anti-apartheid movement. While living, his writings and activism attempted to empower blacks, and he was famous for his slogan, "black is beautiful," which he described as meaning: "man, you are okay as you are, begin to look upon yourself as a human being." The ANC was very hostile to Biko and to Black Consciousness through the 1970s to the mid 1990s but has now included Biko in the pantheon of the struggle's heroes, going so far to use his image for campaign posters in South Africa's first democratic elections, in 1994. In 1987, Richard Attenborough directed the movie, Cry Freedom, telling Biko's story (based on Donald Wood's book), which helped to attract international support for the anti-apartheid struggle. The sheer brutality of how the majority population were treated shocked many, even some who had previously tended to sympathize with the whites on the basis that black Africans could not be expected to run the country as successfully or efficiently as they did. When, following Nelson Mandela's release from prison in 1990, the Apartheid system was replaced by a multi-racial democracy, the euphoria that followed was global. To some degree, Biko's death helped to make this happen. Stephen Biko was born in King Williams Town, in the Eastern Cape province of South Africa. He was a student at the University of Natal Medical School. He was initially involved with the multiracial National Union of South African Students, but after he became convinced that Black, Indian, and Colored students needed an organization of their own, he helped found the South African Students' Organization (SASO) in 1968, and was elected its first president. He felt that white skin afforded all members of the race with a privileged life that was impossible to ignore, even in the case of those who openly denounced the government. This is what Steve Biko advocated when he asserted that whites could not truly identify with the cause of blacks because they were granted the ability to ignore oppression and enjoy racial benefits. The SASO evolved into the influential Black Consciousness Movement (BCM). Ntsiki Mashalaba, Biko's wife, was also a prominent thinker within the Black Consciousness Movement. Ntsiki and Biko had two children together; a daughter, Lerato, born in 1974, who died at the age of two months, and a son, Hlumelo, who was born in 1978, after Biko's death. In 1972, Biko became honorary president of the Black People's Convention. He was banned during the height of apartheid in March 1973, meaning that he was not allowed to speak to more than one person at a time, was restricted to certain areas, and could not make speeches in public. It was also forbidden to quote anything he said, including speeches or simple conversations. When Biko was banned, his movement within the country was restricted to the Eastern Cape, where he was born. After returning there, he formed a number of grassroots organizations based on the notion of self-reliance, including a community clinic, Zanempilo, the Zimele Trust Fund (which helped support ex-political prisoners and their families), Njwaxa Leather-Works Project, and the Ginsberg Education Fund. In spite of the repression of the apartheid government, Biko and the BCM played a significant role in organizing the protests which culminated in the Soweto Uprising of June 16, 1976. In the aftermath of the uprising, which was crushed by heavily-armed police shooting 700 school children protesting, the authorities began to target Biko further. On August 18, 1977, Biko was arrested at a police roadblock under the Terrorism Act No 83 of 1967. He suffered a major head injury while in police custody, and was chained to a window grille for a full day. On September 11, 1977, police loaded him in the back of a Land Rover, naked, and began the 1 200 km drive to Pretoria. He died shortly after arrival at the Pretoria prison, on September 12. The police claimed his death was the result of an extended hunger strike. He was found to have massive injuries to the head, which many saw as strong evidence that he had been brutally clubbed by his captors. Then journalist and now political leader, Helen Zille, exposed the truth behind Biko's death. Due to his fame, news of Biko's death spread quickly, opening many eyes around the world to the brutality of the apartheid regime. His funeral was attended by many hundreds of people, including numerous ambassadors and other diplomats from the United States and Western Europe. Journalist Donald Woods, a personal friend of Biko, photographed his injuries in the morgue. Woods was later forced to flee South Africa for England, where he campaigned against apartheid and further publicized Biko's life and death, writing many newspaper articles and authoring the book, Biko. The following year on February 2, 1978, the Attorney-General of the Eastern Cape stated that he would not prosecute any police involved in the arrest and detention of Biko. During the trial it was claimed that Biko's head injuries were a self-inflicted suicide attempt, and not the result of any beatings. The judge ultimately ruled that a murder charge could not be supported partly because there were no witnesses to the killing. Charges of culpable homicide and assault were also considered, but because the killing occurred in 1977, the time frame for prosecution had expired. The Truth and Reconciliation Commission, which was created following the end of minority rule and the apartheid system, reported in 1997, five former members of the South African security forces had admitted to killing Biko and were applying for amnesty. On October 7, 2003, the South African Justice Ministry officials announced that the five policemen who were accused of killing Biko would not be prosecuted because of insufficient evidence and the fact that the time span for prosecution had elapsed. 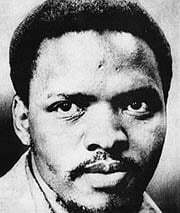 Like Frantz Fanon, Biko originally studied medicine, and also like Fanon, Biko developed an intense concern for the development of black consciousness as a solution to the existential struggles which shape existence, both as a human and as an African (as in Négritude). Biko can thus be seen as a follower of Fanon and Aimé Césaire, in contrast to more pacifist ANC leaders such as Nelson Mandela after his imprisonment at Robben Island, and Albert Lutuli, who were first disciples of Gandhi. Biko saw the struggle to restore African consciousness as having two stages, "Psychological liberation" and "Physical liberation." The non-violent influence of Gandhi and Martin Luther King, Jr. upon Biko is then suspect, as Biko knew that for his struggle to give rise to physical liberation, it was necessary that it exist within the political realities of the apartheid regime, and Biko's non-violence may be seen more as a tactic than a personal conviction. Thus, Biko's BCM had much in common with other left-wing African nationalist movements of the time, such as Amilcar Cabral's PAIGC and Huey Newton's Black Panther Party. Apartheid—both petty and grand—is obviously evil. Nothing can justify the arrogant assumption that a clique of foreigners has the right to decide on the lives of a majority. In time, we shall be in a position to bestow on South Africa the greatest possible gift—a more human face. White Racism and Black Consciousness. To challenge the status quo, Biko felt it was necessary for non-whites to unite. Without reliance on whites, blacks and others would foster their educations and learn to embrace their unique cultures. The black consciousness movement was not about racist notions of superiority, but instead a challenge to a system that had failed to acknowledge the humanity of blacks. Biko would become a martyr for the cause after his death. He would be commemorated for his dedication to the movement after his questionable death at the hands of South African authorities. He is a legendary figure in the history of the anti-apartheid struggle in South Africa. In 1978, Malcolm Clarke recounted Biko's story in a documentary called, The Life and Death of Steve Biko. In 1987, Richard Attenborough directed the movie Cry Freedom, a biographical drama about Biko starring Denzel Washington and Kevin Kline. The Biko Inquest is the television adaptation of the original stage play. Directed by Albert Finney, it originally aired in the U.S. through HBO in 1985. In Star Trek: The Next Generation, there is a starship named USS Biko, NCC-50331, an Oberth class starship which is used for transport or scientific research. The episode in which it appeared was entitled "A Fistful of Datas." In the Disney channel movie The Color of Friendship, he is used as a plot turner in breaking the two teens apart. 1979 play entitled The Biko Inquest, written by Norman Fenton and Jon Blair. Benjamin Zephaniah wrote a poem entitled, "Biko The Greatness," included in Zephaniah's 2001 collection, Too Black, Too Strong. Chinua Achebe includes a quote from Biko in his collection of essays, Hopes and Impediments. Mark Mathabane mentions Biko in his book, Kaffir Boy. Tom Paxton released the song, "The Death of Stephen Biko," on his 1978 album, Heroes. Steel Pulse released the song, "Biko's Kindred Lament," on their 1979 album, Tribute to the Martyrs. Sweet Honey in the Rock's 1981 album, Good News, contains tracks entitled "Biko" and "Chile Your Waters Run Red Through Soweto," which compares Biko's death to that of Chilean musician Victor Jara and was covered by Billy Bragg in 1992. Dave Matthews wrote the song "Cry Freedom" in honor of Biko. The A Tribe Called Quest 1993 album, Midnight Marauders, includes the song, "Steve Biko (Stir It Up)." Beenie Man's 1998 album, Many Moods of Moses, contains a track entitled "Steve Biko." Dead Prez reference Biko in a track entitled, "I'm a African," on their 2000 album, Let's Get Free. Dirty District have a song based on the murder of Steve Biko, titled "Steve Biko," on their debut album, Pousse Au Crime et Longueurs de Temps. Wyclef Jean mentions Steven Biko in the song, "Diallo," on his album, The Ecleftic: Both Sides of the Book. Third Sight names Biko in a track entitled, "Nine In My Pocket," on their 2006 release, Symbionese Liberation Album. Saul Williams names Biko in the song, "Coded Language," in his freshman release, Amethyst Rock Star. Johnny Clegg names Biko in the song, "Asimbonanga," on the album Third World Child. Dilated Peoples names Steve Biko in their song, "Expansion Team Theme," with the lyrics, "Pressin’ heights Pico, live like Steve Biko" (on the Expansion Team LP). Christy Moore sang a song about Biko, called "Biko Drum," which makes several reverences to the South African hero. The song was written by Wally Page. Rory McLeod references Biko in his song, "What Would Jesus Do?" Public Enemy references Biko in the song, "Show Em Watcha Got," on their 1988 album, It Takes A Nation Of Millions To Hold Us Back. Groundation mentions Biko in the verse, "the words of Bantu Biko," in their song, "Silver Tongue Show." Biko is also mentioned in the song, "Suffer the Right," in the lyric, "I, want them to remember/I, Steven Biko." Willy Porter mentions Stephen Biko in the song, "The Trees Have Soul," on his album of the same title. Ian Dury mentions Stephen Biko in the doggerel, "Reasons To Be Cheerful, Part 3." Randy Stonehill sings about Biko in the song "Stand Like Steel" on his 2005 album, Touchstone. Patrice mentions Stephen Biko in his song "Jah Jah Deh Deh," along with other Black leaders: "Burying their bodies was like burying seeds." South African improviser, composer, and bandleader Johnny Dyani (Johnny Mbizo Dyani) recorded an album entitled Song for Biko, featuring a composition (written by Dyani) of the same name. Italian Banda Bassotti mention Steven Biko in their song "Figli de la Stessa Rabbia," on the album with the same name. Simple Minds released the song "Biko" on their album, Street Fighting Years in 1989. ↑ BBC News, Steve Biko. Retrieved April 16, 2007. ↑ Buffalo City government, Biko biography. Retrieved September 2, 2007. ↑ Verashni Pillay, Keeping Steve Biko alive. Retrieved September 19, 2007. ↑ ChickenBones: A Journal, Black Consciousness & Black People's Convention. Retrieved November 16, 2007. ↑ IMBD, The Biko Inquest. Retrieved October 30, 2007. BBC News. Background: Steve Biko: Martyr of the Anti-Apartheid Movement. Retrieved April 16, 2007. Biko, Steve. I Write What I Like. Edited by Aelered Stubbs. San Francisco: Harper & Row, 1986. ISBN 9780062500526. Buffalo City Government. King William's Town's hero: Steve Biko. Retrieved September 2, 2007. ChickenBones: A Journal. Biko Speaks on Africa. Black Consciousness & Black People's Convention. Retrieved November 16, 2007. Heinrichs, Ann. Mahatma Gandhi. Strongsville, OH: Gareth Stevens, 2001. IMBD. The Biko Inquest. Retrieved October 30, 2007. Lens, Sidney. Africa—Awakening Giant. New York: Putnam, 1963. MacLeod, Scott. South Africa: Extremes in Black and Whites. Time. Retrieved November 16, 2007. Malan, Rian. My Traitor's Heart: A South African Exile Returns to Face His Country, His Tribe, and His Conscience. New York: Atlantic Monthly Press, 1990. ISBN 9780871132291. Pillay, Verashni. Keeping Steve Biko Alive. Retrieved September 19, 2007. Stiebel, Lindy. Still Beating the Drum: Critical Perspectives on Lewis Nkosi. Amsterdam and Kenilworth, NJ: Rodopi, 2005. ISBN 9781868144358. Wiredu, Kwasi, William E. Abraham, Abiola Irele, and Ifeanyi A. Menkiti. Companion to African Philosophy. Oxford: Blackwell Publishing, 2003. ISBN 9781405128858. Woods, Daniel. Biko. London: Paddington Press, 1978. ISBN 9780448231693. Biko, Steve. Steve Biko: Black Consciousness in South Africa. Edited by Millard Arnold. New York: Random House, 1978. ISBN 9780394727394. Gibson, Nigel. "Black Consciousness: The dialectics of liberation in South Africa." Centre for Civil Society 18 (2004): 1-28. Young Black Leader Dies in Detention in South Africa, Raising Fears of New Unrest By John F. Burns, special to the New York Times. History of "Stephen Bantu Biko"
This page was last modified on 21 October 2015, at 16:02.